It’s the most wonderful time of the year: Christmas….the chance to spend time with family and friends having fun, giving (and receiving) gifts and baking up a storm! This year, round up your best friends and throw a cupcake Christmas party! Invitations: Buy a package of mini cupcakes and put them in a cute box with a ribbon. Hand-write a pretty invitation and place it in the box with the cupcake. Deliver the little packages to your friends! They will love the sweet treat and party invite combination! Decorations: Decorate your room in happy holiday style. Buy a string of white lights and string them around your windowsill. Hang cupcake Christmas ornaments on the light string for an extra dose of adorable! On your kitchen table place a cupcake stand filled with delicious cupcakes. Fun: Give this party the cuteness touch by baking and decorating three delicious batches of cupcakes. 1. Preheat oven to 350 F (175 C). Grease two 12-cup muffin pans or line with 20 paper baking cups. 2. In a large bowl, beat the butter and sugar with an electric mixer until light and fluffy. Mix in the eggs, buttermilk, red food coloring and vanilla. Stir in the baking soda and vinegar. Combine the flour, cocoa powder and salt; stir into the batter just until blended. Spoon the batter into the prepared cups, dividing evenly. 3. Bake in the preheated oven until the tops spring back when lightly pressed, 20 to 25 minutes. Cool in the pan set over a wire rack. When cool, arrange the cupcakes on a serving platter and frost with cream cheese icing. 1. Beat softened butter and cream cheese until well blended. 2. Add powdered sugar and vanilla. Beat until creamy. 3. Frost the cupcakes and enjoy! 2. To prepare cupcakes, place brown sugar and butter in a large bowl; beat with a mixer at medium speed 2 minutes or until well blended. Add eggs, 1 at a time, beating well after each addition. 3. Lightly spoon flour into dry measuring cups; level with a knife. 4. Combine flour, cocoa, baking powder, baking soda, and salt in a bowl, stirring well with a whisk. 5. Add flour mixture to sugar mixture alternately with buttermilk, beginning and ending with the flour mixture. Stir in vanilla extract. 6. Spoon batter into 18 muffin cups lined with paper liners. Bake at 350° for 12 minutes or until cupcakes spring back when touched lightly in the center. Cool in pan 10 minutes on a wire rack; remove from pan. Cool completely on wire rack. 7. To prepare frosting, combine powdered sugar, cream cheese, and peppermint extract in a bowl, stirring until smooth. 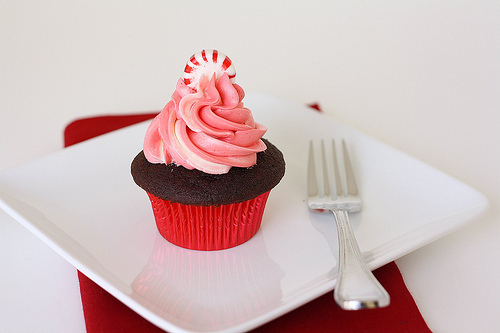 Spread about 4 teaspoons frosting on each cupcake; sprinkle evenly with candy cane bits. 1. Preheat the oven to 350 F (175 C). Butter or line with paper liners a 12-cup muffin tin. 2. Cream 5 tablespoons of the butter with the white sugar. Add the molasses and the egg and egg yolk. 3. Sift together the flour, cocoa powder, ginger, cinnamon, allspice, nutmeg and salt. Dissolve the baking soda in the hot milk. Add the flour mixture to the creamed mixture and stir until just combined. Stir in the hot milk mixture. Pour the batter evenly into the prepared tin. 4. Bake at 350 F (175 C) for 20 minutes or until slightly springy to the touch. Allow to cool a few minutes in the pan and remove to a rack to cool. To Make Frosting: Cream the 2 tablespoons butter and the cream cheese together. Beat in the confectioners' sugar until fluffy. Add the lemon extract and beat. 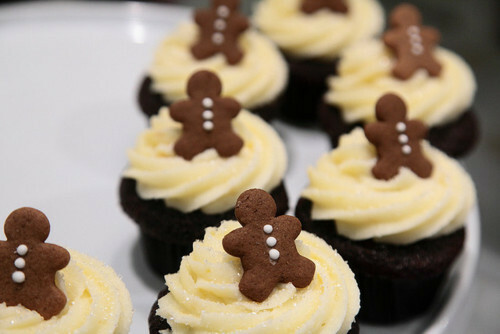 When the cupcakes are cool, frost the tops with cream cheese frosting (recipe above) and enjoy!